My dad is in the process of packing up and selling our old family home. And, although I realise all too well that, at 69, he can't possibly keep (and definitely doesn't need!) a house of that size any longer, it's been quite an emotional journey for me to help sort through everything and let most of it go. The memories...! 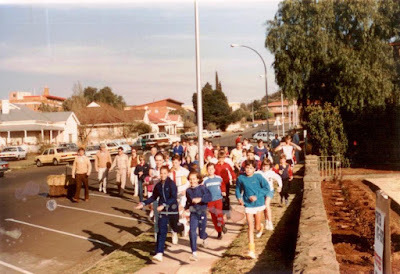 One of the good things that came from sorting through years and years of stuff, is the fact that I finally found a picture that I've literally been searching for for years - one of my very first 5 km fun run. I still remember that day so well: I was 10 years old and ran with my best friend, Karlien. I ended up finishing second and got a Barbie doll as a prize, but most of all I remember how much fun I had. I loved it. I'm in the dark blue tracksuit, centre front. I love studying this picture: My dark blue tracksuit (a colour I love to this day! ), my hairstyle (haha! 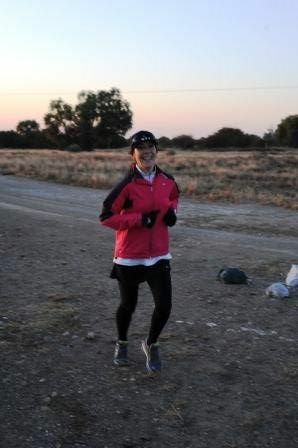 ), my mid-foot strike, and the huge smile on my face. That smile perfectly sums up this memory for me. And now, 28 years later, I still love running just as much as I did on that winter's day in 1987. My stride has changed a bit, and so has my hairstyle (phew! ), but the smile is still the same. Here's to the next 28 years of running! Love that you were able to find that picture! I get how emotional it can be to be selling your childhood home. I literally squealed when I found it, Lisa! I've been looking for it for SO long! It's really hard for me to say goodbye to our old home... We spent so many happy years there before my mom passed away - fortunately those memories are mine forever :) . SO happy that I found it, Jeanette - such a lovely memory and so glad that it was captured on film!